Solid and liquid particles, one-eighth the diameter of a human hair, are floating in the air we breathe every day. These particles are called fine particulate matter or PM2.5. PM2.5 is made up of common substances known as nitrogen dioxide, organic carbon, and sulphur dioxide. Natural sources of PM2.5 include wind-blown dust and forest fires. Human activities include transportation, industrial processes, home heating, and biomass burning. These fine particles are linked to health implications. They are able to move deep into the respiratory tract, including the lungs, which can affect individuals with existing heart an d/or respiratory illnesses. Fort Air Partnership’s air monitoring stations measure the amount of particulate matter in the air. 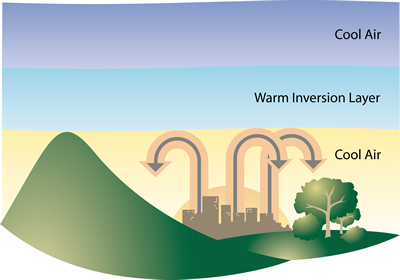 Higher measurements are often recorded in cold winter months due to temperature inversions. Cold air becomes trapped near the ground by a layer of warm air. The warm air acts like a lid and prevents pollutants from mixing within the atmosphere. This leads to a build-up of pollutants, including PM2.5 near the ground until the weather brings in wind, rain, or snow to help disperse them. Some sources of particulate matter, like industrial emissions, stay fairly constant year round. But roaring fireplaces and idling vehicles in winter lead to higher levels of particulate matter. In January 2015, a Fine Particulate Matter Response Plan for the Capital Region was finalized. The plan came about because measurements of PM2.5 at two monitoring stations in the Edmonton area between 2008 and 2011 periodically exceeded the national level for PM2.5. Implementation of the Fine Particulate Matter Response Plan will begin later in 2015. Measurements of PM2.5 taken by Fort Air Partnership and other airsheds will be compared to new Canadian Ambient Air Quality Standards to manage increasing levels of PM2.5 throughout Canada. Some examples of actions that people can take during the wintertime to reduce their contribution to PM2.5 include carpooling, turn off the engine to their cars when parked (don’t idle) and working from home on days with high levels of PM2.5, if possible.